Global wood-based panel production surged to a new record high in 2013. 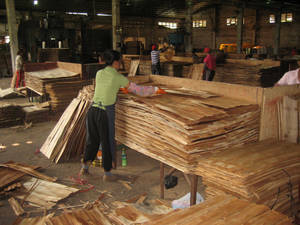 Manufacturing of plywood - one of the types of wood-based panels - in Hainan province, China. 18 December 2014, Rome - Global production of all major wood products continued to show steady growth in 2013 for the fourth consecutive year, according to new data published by FAO today. While the production of industrial roundwood, sawnwood, wood pellets and wood-based panels have fully recovered from the economic downturn in 2008-2009, global production of pulp and paper stagnated in 2012-13 largely due to a decline in consumption in China, where electronic publishing is increasingly being used instead of traditional printing processes. Wood production in 2013 exceeded the pre-recession level of 2007 in all product groups, except for sawnwood. Asia-Pacific, Latin America and Caribbean and Northern America have seen the fastest recovery in wood production. Recovery in Europe slowed down in 2012 and has yet to recover especially in western and southern Europe where production and consumption fell in 2012-13 for some products such as industrial roundwood and wood-based panels. Wood pellet production soared to an all time high in 2013, mainly driven by bioenergy policies and consumption targets in Europe, according to FAO's latest data. Global production of wood pellets grew by 12 percent in 2013, reaching 22 million tonnes. Over half of this (13 million tonnes) was traded internationally. Markets for wood pellets are dominated by Europe and Northern America, which accounted for almost all global production (62 percent and 34 percent respectively) and consumption (81 percent and 15 percent respectively) in 2013. Trade in pellets from Northern America to Europe, mainly the UK, also doubled in 2013 from the previous year. In China, production of paper and consumption of pulp and wastepaper - the two main products used to manufacture paper - declined slightly (by one percent) in 2013 for the first time after 38 years of uninterrupted growth. The downturn in the world's largest producer and consumer of paper was largely responsible for the stagnation in global pulp and paper production in 2013. "The developments in Chinese paper consumption are worth noting for the future," said Adrian Whiteman, FAO Senior Forest Economist. "If people in China are switching to electronic media as so many of us have in the West, this will be the end of one of the few remaining centres of growth in printing and writing paper consumption". In contrast to this, China continues to increase in importance as a producer and consumer of other forest products. In 2013 the country overtook a number of other major countries in different product groups, for example, Canada in sawnwood production and the United States of America in sawnwood consumption. China's imports of industrial roundwood and sawnwood also surged by 18 percent and reached record levels in 2013. Production and consumption of wood-based panels and sawnwood appears to be growing strongly in most regions. In 2013, global sawnwood production totalled 421 million cubic metres, representing an increase of 4.6 percent compared to 2012 and an increase of 22 percent from 2009. Sawnwood production has been recovering gradually over the period 2009-13, largely due to production growth in three regions: Europe, Northern America and Asia-Pacific. In contrast, production in Africa and Latin America and Caribbean remained modest over the same period. In 2013, global wood-based panel production surged to a new record high of 358 million cubic metres - up 7.8 percent from 2012 and 35 percent from 2009. Wood-based panels were the only product category that did not contract during the recent recession and their production has been growing steadily. This is due to rapid and consistent growth in the Asia-Pacific and Latin America and Caribbean regions, where production has increased by 59 percent and 23 percent respectively over the period 2009-13.